I don't know, but when I look back at the almost 50 years I've spent in aviation, it seems to me that my career didn't unfold as it really should have. Rather than the orderly, planned and supervised tempering of my peers, my progression into and through the various aviation endeavors always seemed to happen in spasmodic bursts that left me with Alice in Wonderland-like bewilderment, looking around at my next role, as a flight instructor, or a survey pilot or whatever new phase I found myself in, totally clueless about how to properly proceed. For one thing, I had no real mentors, other than the odd instructors that popped up at vital times, and then were gone. I was a restless student pilot with my own airplane, and by keeping it at small, out of the way strips I managed to stay under the radar for about 500 hour of dangerous wandering before settling down enough to get my Private License. Adding the Commercial License seemed like a natural thing to do since my log book was fat with hours, and when the examiner told me I flew well enough to pass the Flight Instructor's exam I decided to get that rating too. Up to this point most all of my aviation formatting had taken place in wild and wonderful West Virginia. And while it was truly a beautiful and peaceful place to fly and to live, the sixties there offered scant opportunity for me to attach myself to a successful FBO and learn the nuances of the aviation business from people who had actually done it. I pondered what to do with my new ratings. 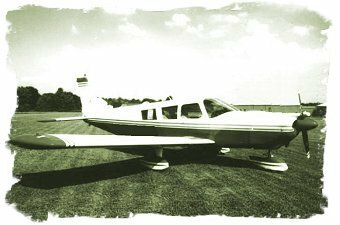 And so it was the late sixties found me teaching flying at a small sod airport in central West Virginia, where I was probably learning more from my students than my students were learning from me. I had leased the almost deserted field and with the entrepreneurial zeal of the young and the dumb, I had started a flying school which I had inexplicitly named, 'The Charlie Brown Flying School'. To everyone's amazement, mine most of all, the students swarmed the place. I was instructing in a Champ and a Citabria and the prices were much lower that the surrounding schools with their new Cherokees and Cessna 150's and the little business boomed. Then, never being one to leave well enough alone, I started thinking about a charter service. That because I was getting repeated requests for it from local businessmen and they all told me they would use it if I had it. They were desperate because at this time the interstate highway system had not yet arrived in West Virginia and driving a hundred straight line miles meant three hours and 150 miles of nausea inducing, serpentine, secondary roads. This was a harvest awaiting the reaper I thought, and I decided to get an airplane suitable for transporting passengers. After looking and comparing different aircraft I decided on a five year old Cherokee Six that I found in Trade-A-Plane. The Six had arrived at our airport with much fanfare and as I was admiring it and getting ready to hang out my new 'Charter Flights Available' shingle, a friend who worked for a large charter operator out of state came by. As we stood talking about my new venture into the people transport business, he asked if I'd had trouble getting my 135 certificate from the Feds. My deer-in-the-headlights look was followed with a gulped 'what is a 135?' My friend proceeded to enlighten me about how the days of having a Commercial License and an airplane with a 100 hour inspection was enough to do charter were over, and had been since half the country stars in Nashville had been wiped out by airplane crashes. I discontentedly placed a call to the FAA. During the next several weeks I proceeded to get the education that I should have gotten before I bought the airplane that was now setting in the hangar, munching on cash flow and contributing nothing. Six long and frustrating months later I was holding the vaunted certificate in my hand and I put out the word to the local businesses that we were now open for the charter business. The trips started to come in, slowly at first, then increasingly, and the flights started fanning out like spokes from a hub in the middle of the West Virginia. As I 135ed my way around the country I was learning, but I had the nagging feeling that what I learned today I really could have used yesterday. All this was legally done, as hard as it is to believe now, without benefit of an Instrument ticket. Early on, one part of our business that started off briskly and remained steady was the transport of the deceased for the local funeral homes. In those days West Virginia was pretty much a one industry state and a boy learned early that upon graduation his employment choices pretty much were; 'coal mines, moonshine or moving on down the line'. Thousands of our people moved down that line, to Ohio, to Michigan and to the Carolinas and other progressive states to gain work. They lived their lives apart from their beloved land and most of them hated it. Almost all of them though, came home when they died, to be buried beside loved ones in the hallowed soil that had failed to support them, and it became our job to provide them the last ride home. Our transport service (as it was called in the funeral business) provided some of the most interesting flying that I did and led to some heart stopping (for me) moments that I remember well. One such occasion occurred at night while transporting in the 172. By experimenting we had found that fitting a prone and totally inflexible passenger into a 172 was very difficult, but not impossible. To get the stretcher with the sheet shrouded body strapped to it into the airplane, the copilot's seat was removed and the head of the stretcher placed on the floor by the rudder pedals with the foot of it resting on the back seat. This created what would have been a very uncomfortable head down angle for the deceased if they hadn't been deceased, but gave just enough clearance to make the whole thing work. 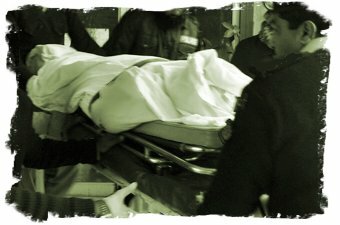 This position of the stretcher created of course, a very intimate setting for the transported and the transporter. On this particular flight, over the forbidding Appalachians on a dark and stormy night, I found myself thinking about an old movie that I had attended with my parents when I was very young. Really, the only part that I remembered in any detail was the scene where an old horse drawn funeral coach was plodding through the night, flickering carriage lanterns accompanied by intermittent lightning from an approaching storm. The driver was bowed miserably over his reins and the music told us that something really bad was about to happen. The camera was focused from about where the horse's backs would have been and it showed the grim countenance of the driver with the wrapped form of the dead man in the back behind him. Suddenly and horribly the body sat up and even more horribly, the driver didn't know it. I couldn't remember anything else, so I can't say what the fate of the driver turned out to be, but as I flew along I was reflecting how odd it was that I'd be in a situation so eerily reminiscent of that long ago movie. In this setting then, out of the corner of my eye I saw in the red glow of the overhead instrument light, something moving. Something to my right and way down low. Something that was just about, well, I had to face it, it was just about where the dead man's head was resting. I can't say how long it was until I actually looked over and down and saw the hair on the corpse blowing in the stream of air from the overhead vent, but enough time passed to convince me that I probably wouldn't consider undertaking as a second profession and also that I had a very strong heart that was at that moment making every effort to beat its way out of my chest. Another recalled flight happened when I was taking a rare day off and was at the family farm. I got a call from my not-really-big-on-details airport helper, Russ. The funeral home had called, he said, and we needed to pick up a body at such and so airport in Delaware. I inquired which funeral home that might be, and I really should have known from the three beat hesitation before he replied that I needed to confirmed it with the home. Ford Funeral Home, he replied confidently. They were one of our regular customers and located in the town of Grafton. I didn't confirm it. I scrambled to the airport and made my way to Delaware where the pickup went smoothly. By late afternoon I was in the pattern for Roy Airport, a 1600 foot dirt strip that served as Grafton's airport and where you put it down on the numbers each time and every time, or else, because there was no go around here, due to a very high hill at the south end. The owner and strips namesake, Bob Roy met me as I taxied up to the barn that served as the activity headquarters, delighted as always to have activity at his strip. I failed to see the funeral home's hearse, which I thought was odd, since the director was always there to meet me when I made a delivery We walked out to the house where I called the funeral home. Mr Ford was out and the person I spoke with didn't know about the delivery. I asked them to have Mr. Ford call when he came in and we trooped back to the airplane. Since the day was warm, I asked Bob if we could transfer the body to the basement of his house where it would be cooler while we awaited the hearse. This was accomplished and Bob and I sat beside the couch where the body rested and we visited in reverent tones, much as if conducting and impromptu wake. At this moment Bob's wife, whom we belatedly realized hadn't been made privy to the arrangements concerning the visiting dead man, walked into the room. I'm almost sure she would have swooned but for the fact that the only couch was occupied. A few minutes later Mr Ford called and, no surprise at this point, it wasn't his body. I then called another funeral home in Elkins which also used us, and through judicious phrasing, managed to find out for sure that it was they who were expecting the body without them realizing that we were asking the question. We then loaded up the overly transported, who by then if he could have, surely would have been inquiring if we knew what the hell we were doing, and made our way to Elkins. There remain several snap shots in my brain of my time in the transport business, those few seconds when something bazaar occurs during a routine flight and which your mind chooses to remember totally out of context. In one I see me crouching over the transported, laying on him really, and reaching through the aft bulkhead of the Six, trying to free a frozen trim while my copilot flew, high above the frozen mountains. In another (I still feel bad about this) I see myself running across one very cold and windy ramp, trying to reclaim the sheet that had so recently wrapped the aged and otherwise naked body of the transported. I always tried to do this important job with the reverence that it deserved, but without the protection of the casket the dignity of the deceased sometimes suffered. I suppose that today this sort of transport isn't done. At least I hope it isn't before it's time for my final flight.